Titan Poker is an online poker room on the iPoker Network, a popular and rapidly growing European focused network, which has been establishing itself over the past couple of years as the biggest of its kind. Titan Poker's software is developed by Playtech, a leading software developer in the gambling industry, and many poker players will agree that their software is one of the user friendliest around, and thus very easy to understand for new players (more about this below). They offer a wide range of tournaments, Sit 'n Gos, and ring games, but also plenty of satellites to land based events, as well as online competitions such as the European Championship of Poker (ECOOP) with huge guaranteed prize pools. Their regular SNG tournaments have prizes reaching up as high as $50,000, although these hardly ever run full. If you like big buy-in Sit 'n Gos, we would suggest the $200+15 Turbo SNGs next to, of course, plenty of lower buy-in SNGs to choose from - starting at a mere $1+0.20. Last year, many of Titan Poker's players have qualified themselves for the World Series of Poker by participating in one of the site's super satellites, and they were awarded with seats at the 2010 WSOP Main Event. 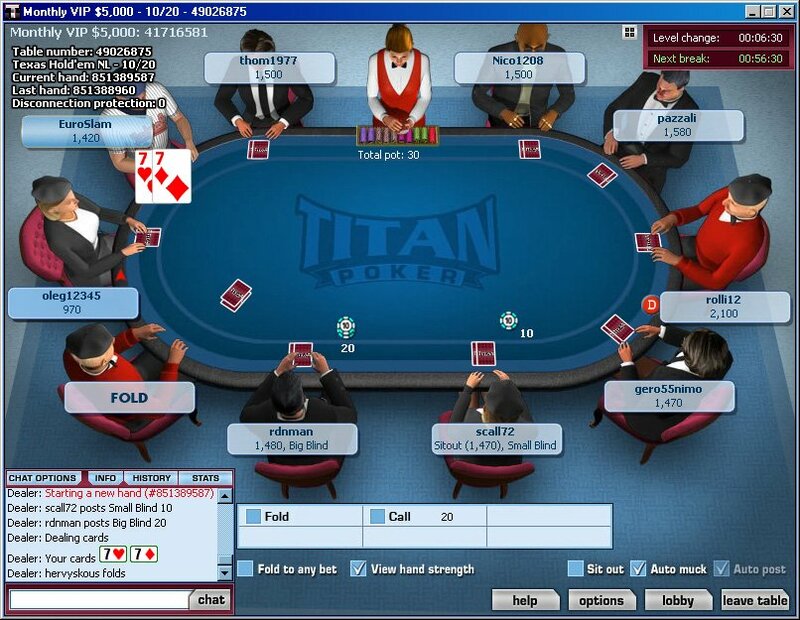 Titan Poker also hosts a variety of other poker tournaments with incredibly high prize pools, for instance the 1.5 million guaranteed ECOOP Main Event which was held in June of 2010. Their offer of more than $2 million in guarantees every month, among it the $200,000 GTD weekly, is unequalled by the other European sites. Poker For Free recommends Titan Poker to all players that are looking to win tournaments and Sit 'n Gos, with at least basic knowledge of poker, as the level of play has risen over the years, especially after the recent shutdown of Full Tilt Poker. More advanced poker players will find the challenge in playing satellites and earn cheap entry tickets into major online poker events, as well as live events. In the following part of our Titan Poker review you can read in-depth information about Titan Poker's client, website, security & integrity, traffic & games, bonuses & promotions and support. We already mentioned it, as a poker player you will experience an innovative, and user friendly interface with sharp looking graphics. Besides English as its default language, you can also download Titan Poker in English, German, Czech, Danish, Dutch, Finnish, French, Italian, Norwegian, Polish, Portuguese, Romanian, Russian, Spanish, and Swedish. The Titan Poker software is manufactured by Playtech and has many great features, including mini view (a must when playing on multiple tables simultaneously), full screen mode, ability to keep player notes, statistics, and real time game - and tournament history. While playing you can chose to see the hand values and the amount of Titan Points you earn while playing ring games. You can keep a buddy list (or better yet, a list of players you like to play against) and see when they are online or not. Are you a dual-screen multi-table player? Good news, because Titan Poker gives you the ability to play up to 16 tables at once. The software also includes a live chat option, giving you the opportunity to get in touch with support instantly. We like to give you something extra if you decide to choose to sign-up at Titan Poker through one of the links provided on Poker For Free. If you make a first deposit, you will get the our special bonus of 200% up to $2,000 PLUS an additional $20, or $50 free, depending on the height of your first deposit. $20 to $49 gets you the $20 instant bonus, where $50 or more gets you the $50 instant bonus. Remember, only we give you the additional bonus, so make sure to use our dedicate bonus code - PFF2000 - to claim our improved Titan Poker bonus offer. One of the coolest promotions on Titan Poker certainly is the ECOOP, i.e. the European Championship of Online Poker. This event lasts for about a month and consists of some great poker tournaments where the winners will win an official ECOOP bracelet, next to cash prizes. The last ECOOP VI had a total guaranteed prize pool of $5,100,000, including a $1,500,000 guaranteed main event where the winner, Andrej "CuCbKu" Mitlyanski from Russia, took home a cool $330,000. Of course, the best place to keep track of Titan Poker's ongoing promotions (either offered on the entire iPoker Network, or directly at Titan Poker) is their website, which can be found at TitanPoker.com. Titan Poker is licensed and regulated by the Antiguan Gaming Government. They have official licenses to operate in most western European countries. As written on the Titan Poker website, and obviously a common thing for poker rooms on the iPoker Network, they make use of the utmost available technologies to ensure that your private information remains completely safe. All data is transferred using encryption technologies, and once stored on their servers it is maintained safe using the latest firewall technologies available. They state to be absolutely committed to keep cheaters away from Titan Poker, so that their players can enjoy playing at Titan Poker reassured in the knowledge that their play is backed up by fairness and integrity. To ensure fair gaming, they employ a combination of automated (complex algorithms) and human monitoring tools to identify irregular play patterns and prevent collusion between two or more players. Before you continue reading, in the top op this Titan Poker review we have integrated a live traffic counter, which displays the current players online, as well as the current active tables. When an online poker room like Titan Poker makes part of a respectable sized network like the iPoker Network - where multiple online poker rooms share their players, they can guarantee traffic around the clock. Actually, Titan Poker is the flagship site of the iPoker Network, meaning they are the largest in numbers of dedicated players. All together you will be able to find an average of 30,000 poker players a night. While most traffic can be found at the Texas Hold'em tables, which isn't a real surprise as this is by far the most popular variation of the game of poker, you should also be able to find yourself a game if you're into Ohama Hi, as well as Omaha Hi/Lo. They also offer 7-Card Stud, 5-Card Draw, and Razz, but the seats at those tables remain empty most of the day. All kinds of popular tournament formats like heads-up, sit-and-go, and multi-table are available. These are offered in all kinds of structures: Double or Nothing (DoN), Bounty, Shootout, etc. Next to that, Titan Poker offers a wide range of cash games in the usual betting structures (Limit, No-Limit, and Pot Limit). You can understand that Titan Poker has seen an incredible growth after the close down of Full Tilt Poker at the end of June, 2011. Many European poker players have found themselves a new home at Titan Poker, and many more are expected to turn to this fast growing online poker room this summer. There are hardly any moments throughout the course of the day when you can't find an active table that suits you, however, since Titan Poker is an European focused poker room, nights are mostly a lot less crowded, specifically for other poker variations than Texas Hold'em. While Titan Poker doesn't have the size like PokerStars, or like Full Tilt Poker formerly did, their traffic is of very respectable size, and we truly believe that they are well worth your consideration. 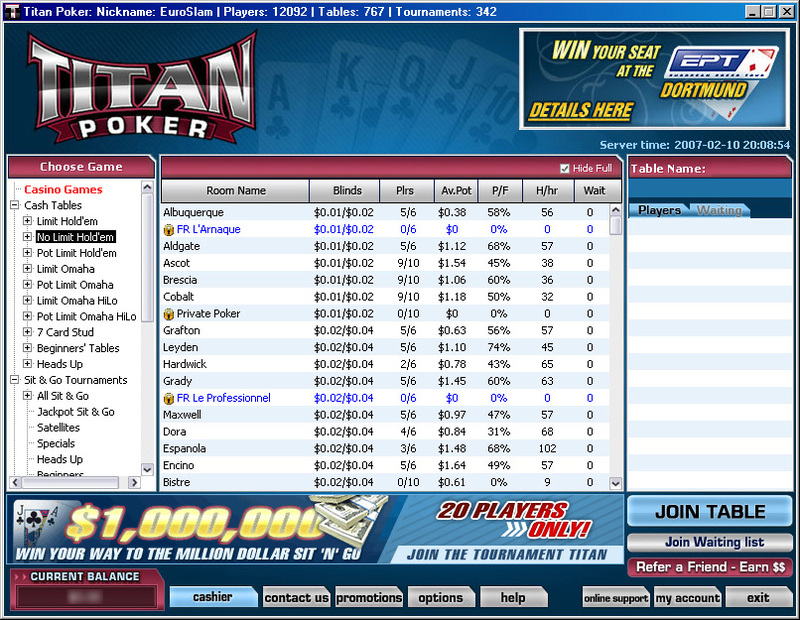 Not too long ago, Titan Poker did a major makeover for their online web presence. The new multi-lingual TitanPoker.com was build from the bottom up and this was for the better, as the looks of their old website were a little outdated. Dynamic information regarding active players is shown on the homepage, which by the way, you can see in the right column of this review as well. One thing they did really well (and other online poker rooms should take the opportunity to learn from this) is adding the most important phone numbers for their 24/7 support department in a very visible spot. This way, if you ever want to contact them, you won't need to digg through several pages ending up being frustrated not finding a number. Besides all kind of regular information, such as about us, getting started (including a Texas Hold'em tutorial), how to play and so on, TitanPoker.com offers information about their online tournaments and promotions. Talking about tournaments, their website covers plenty of information about their satellites to live events, including the EPT, WSOP, Aussie Millions and more. Titan Poker have an outsourced support department. They can be reached through various e-mail addresses, (toll free) phone numbers, and the recommended instant chat feature for a very quick response. A little annoying is their standard response after you have been helped, offering some kind of bonus when making a deposit, however you may also find this useful. In 2006, 2007, and 2008 Titan Poker was awarded Gambling Online Magazine's Gold Award for providing the best online customer support. This award was the result of votes from hundreds of readers and website visitors.